The stock market is a wild, crazy, and sometimes scary place. Especially these days with the extreme volatility of the past few years and the recurring news of corrupt bankers and their devious practices. But the stock market, whether we like it or not, is one of the best places to build wealth. To reap the benefits of the market, do you have to simply accept the fact that you need to just dive in and become a bobbing ship in a large, violent, and unpredictable ocean? There are aspects of investing in the stock market that are within your control that can greatly affect your total returns. So instead of focusing on the things that you can’t control, focus on the things that you can. The first aspect of investing that you can control, which I am going to discuss in this article series, is unique risk. There is quite a bit of background information that I need to supply to properly describe how to eliminate unique risk so I’m going to break this topic into three separate, action-packed articles. So get comfortable and get a nicely sharpened #2 pencil ready because we are about to geek out with some math and financial theory! 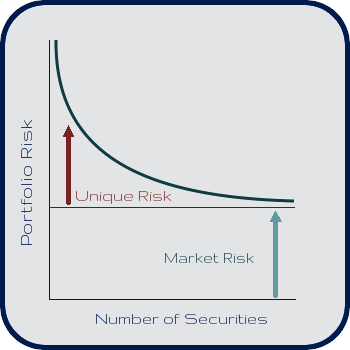 Your portfolio’s risk is made up of two parts: Market (Systemic) Risk and Unique (Idiosyncratic) Risk. Market risk represents economy-wide factors that are out of your control, like interest rates, government spending, inflation, etc. Unique risk represents firm-specific factors such as labor strikes, patent decisions, competitor emergence, etc. There is not much you can do about market risk so if you want to invest in the market, you have to accept that you will be exposed to market risk. Unique risk, however, is within your control. 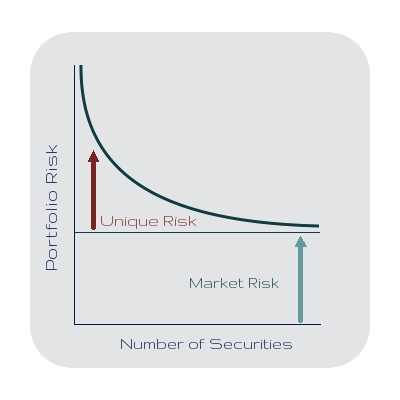 If you understand unique risk and take it into account when building your portfolio, you can greatly reduce the amount of overall risk your portfolio is exposed to. So how can you eliminate unique risk? As you combine different types of stocks in your portfolio, you begin to decrease the amount of unique risk you are exposed to. If you have many different types of stocks in your portfolio, unique risk ceases to be a factor at all and you are left with only market risk. Say you invest in Stock A. Stock A is a nice, stable “blue-chip” company stock that isn’t too exciting but isn’t too scary either. It hasn’t been very volatile in the past but it hasn’t exactly tripled in value every year either. You are happy with this stock and are comfortable with the risk associated with owning it. Being a fientist who loves technology, you discover a company that you know is going to do great things, you just don’t know when. The company’s stock, however, is very volatile and sees major daily swings. You want to invest in Stock B but you don’t think your stomach can take it. Someone who does not know how diversification works would probably assume that adding Stock B to your portfolio would always increase the risk of the portfolio. In actuality, it is possible that adding Stock B could lower your portfolio’s risk! Variance is the unit of measure for risk (standard deviation, which is simply the square root of the variance value, is also a measure of risk). When building a portfolio, you want to try to do one of two things (preferably both): lower the variance and/or increase the expected return. In other words, you want to make more money while having less stress. So say Stock A has an expected return of 4% and a standard deviation of 6% and Stock B has an expected return of 8% and a standard deviation of 15%. You’d expect that by combining the two stocks in your portfolio, your portfolio’s expected return and standard deviation would be an average of the two individual values. While that is true for the expected return value, it’s not the case for the standard deviation. When combining two stocks, you must determine their correlation with each other to understand how much risk the combination of the stocks produces. If the two stocks mentioned above are negatively correlated with each other, adding the riskier stock to the portfolio can actually lower your portfolio’s risk! As expected, the expected return of the portfolio is the average of the expected returns of the individual stocks. In this example, adding Stock B to your portfolio is a great idea because it should increase your expected return from 4% to 6% while also lowering your portfolio’s standard deviation from 6% to 5.81%! As we’ve just seen, an individual stock’s riskiness doesn’t matter; it is the correlation between the individual stock and your existing portfolio and how the individual stock affects the portfolio’s risk that actually determines whether a stock would be a good investment. So does this mean you should go out and start picking a bunch of individual stocks to invest in? Not necessarily. Next time I will discuss the minimum variance portfolio and will describe how to best construct a portfolio that minimizes unique risk. Exactly, and exactly what an Index Fund like VTSAX does for investors. Definitely, Jim! There’s no cheaper or more efficient way to eliminate unique risk than to simply buy the entire market from Vanguard (VTSAX)! What is the correlation between stocks and how does one determine it? The correlation between stocks is how they move in relation to one another and the amount of correlation is represented by the correlation coefficient. The correlation coefficient is a decimal number between -1 and 1 (a positive correlation coefficient indicates that two stocks move together in the same direction, a negative coefficient indicates they move in opposite directions, and a correlation coefficient of 0 means they are not correlated so their movements are completely independent). You can use historical data to calculate the covariance and the standard deviation and then use those values to solve for the correlation coefficient. Excel can help make this process easier and there may be calculators online to help as well. I would definitely recommend saving yourself the hassle though by simply investing in a diversified, total market index fund. Thanks for the explanation. I agree, saving the hassle by investing in an index fund is the best choice for me. I mainly just wanted to squeeze some more information out of you for my own edification. Thanks for your blog, I learn so much from it. It was a good question and something I probably should have explained in greater detail in the post. It was such a struggle keeping this article and the other two Unique Risk articles concise, due to the vast amount of information that needed to be presented to support my argument. Definitely don’t hesitate to ask if anything else isn’t clear or fully explained. The comment section is a perfect place to iron out some of these finer details. Why do you specifically say that if ρ is negative then adding a riskier stock could lower unique risk? It’s true, but that can happen even if ρ is positive, because the xs are being squared. For example, with your two stocks but a covariance of +0.2, the formula on the next page is minimized at 92% stock A, 8% stock B, for a portfolio variance of 34.56, or a standard deviation of about 5.88%. Note that this has us investing in both even with a positive covariance. A great introduction to investing and risk. Correlations are difficult to determine and break down over time but this is essential building blocks of risk management. One comment would be have a look at Long Term Capital Management who “specialised” in spreads that were meant to be uncorrelated based on historical data and therefor offer a hedge. In times of panic investors sell what they can, where liquidity is available to cover losses in other parts of the portfolio or meet cash demands.Regardless of underlying value. In times of panic correlations often go to 1, there is what you may call a “global margin call” which is what happened in the GFC. Couldn’t find a post on ETF’s so apologies for hijacking this one. I was just curious since I have recently dropped a big chunk of savings into a few different Blackrock ETF’s that I really like. Since they reinvest the dividends into the fund automatically, I don’t actually have access to that on an annual basis (as cash), so as a long term strategy, what do you do? Sell shares on an annual basis when you have enough for retirement? I know you guys are generally big into your ETF’s so hopefully you can shed some light.